Today’s #Watch demonstrates how Reader-Friendly Design (4m40s) can improve a proposal, making it more likely that readers will consider the document fully. The video shows a before-and-after version of a chunk of text from a proposal and walks through the changes that make the original document easier to read. 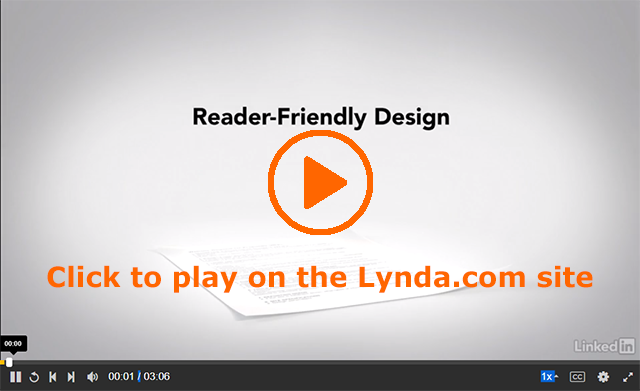 The video shows why it’s important to pay attention to paragraphing, headings, and document structures like bullet lists for a reader-friendly design. I always believed that using bullet points took away from the professionalism of a paper. It’s interesting to learn that they are more helpful than harmful, and now that it has been brought to my attention, I can see how it makes the paper easier to read and less crowded. I will definitely be swapping some long listings in my paragraphs with bullet points. Even though bullet points are primarily used for note taking and power points, they are a very strong tool for writing a proposal. Utilizing bullet points directs the reader to the big idea of a concept while you can refer to it later in the proposal for the facts and details. In my short proposal, I tried to utilize bullet points when my lists were longer than 3 items. I was shocked to find out the use of bullet points is preferred over paragraph form because I always thought bullet points were more informal than complete sentences. I agree that it’s easier to read something when it’s bulleted and I may consider using this tactic for my project. We try to make proposals that will be easy for the company to compare. If a company is trying to choose between a set of proposals, using a list with bullets to organize costs, for example, will let them easily compare it to another proposal. Keeping things well organized, simple, and easy to read takes the guesswork out of comparisons for the company. They will be more willing to use it.